The Arc’teryx Big Mountain Weekend will be taking place from the 3rd - 5th May at the Sticklebarn in the beautiful Langdale Valley, Lake District. 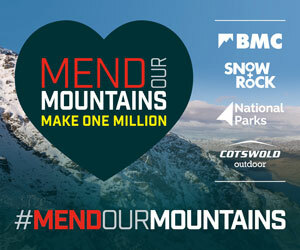 The aim of the event is to educate, share and improve skills necessary for enjoying the mountains and crags safely. The 2019 Annual General Meeting of the British Mountaineering Council is taking place on Sunday 31 March 2019 at the Devonshire Dome in Buxton. Considering organising a BMC Event? You've come to the right place. The information you need is set out below and starts with Event Approval. This page is for BMC Volunteers to find information to support them in their role. Even in the age of web clickbait, print still has the power to inspire and inform your outdoor experiences. Here are 10 of our favourite walking and climbing magazines. It seems incredible that the all-time classic climbing film, Hard Grit, is almost twenty years old this year. And in a spirit of milking the past for all it's worth, some of the people behind the film are getting together for a once-in-a-lifetime live event in Sheffield to remember the fun and spirit that went into the film, and the climbs that it spawned. April 1st – this ain’t no joke. Rock climbing photographer Simon Carter has captured unique & awe-inspiring images that have launched climbing on the world stage. Find out more in this Nikon short. Tom Randall and Pete Whittaker spent 8 weeks in the US in search of the most difficult off-widths they could find. "Century Crack" is the hardest off-width in the world. Stevie Haston attempted this route in the 90's with no success. No one believed the route would ever be climbed. Alstrin Film & Hot Aches Productions have teamed up to document their two year journey. Film due autumn 2012. A fantastic video made by Keith Bradbury and filmed for The North Face of James Pearson on his recent epic trip to Pembroke where he obliterated lots of previous highs with a bunch of great ascents culminating in the first E10 ground up. These look absolutely fantastic! However a bit short notice to book the time off work - will there be more of these in the 2019 year? Any chance of providing similar in Plymouth area? Definitely a lack of high level coaching CPD in Plymouth/Cornwall area.